A smartphone case designed to give DSLR-like control is set to go into production after raising more than six times its $100,000 goal on crowdfunding website Kickstarter. Billed as the fastest way to take pictures using a phone, the Moment Case is initially designed for use with the Apple iPhone 6, but may be extended to other models. The project has officially been funded from today (26 February) after winning pledges totalling $677,742 from more than 4,700 backers on Kickstarter. Key features include a ‘multi-state button that enables half-press and full-press features, just like a DSLR camera’. 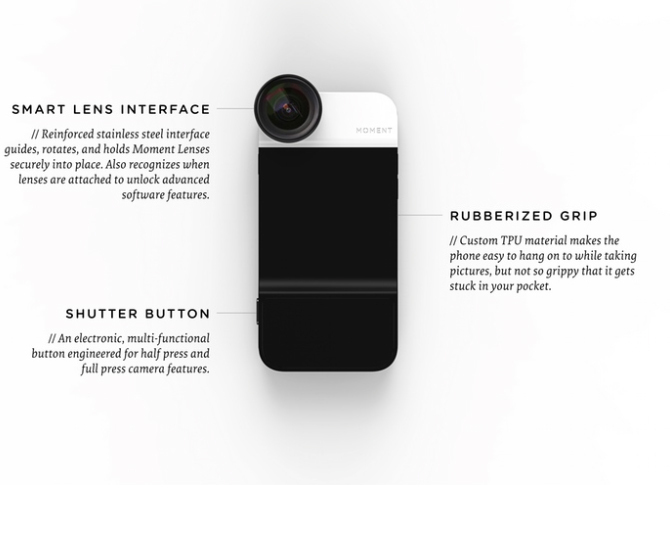 The Kickstarter project page adds: ‘You can half-press it to lock focus and exposure onto a subject like never before. Or hold it down to unlock burst mode. ‘What makes our approach unique is an electronic button, not a mechanical gimmick. ‘Powered by a coin-cell battery and connected to the phone via low-energy Bluetooth, we have spent a lot of time making sure the button is incredibly responsive. Just like you would expect with a high-end camera’. The shutter button can be used to focus, while the phone’s touchscreen can be used to ‘fine-tune the lighting’. The case will be compatible with separately available Moment lenses, the attachment of which enable the Moment App to display lens features. A lens will come as part of the kit. A camera strap can also be attached to the device. The Moment Case will initially work with the iPhone 6, but may be extended to the iPhone 6+ smartphone and other devices in future, according to the Seattle-based developers who say the first case will be available from June, priced $79. Photographers have already been busy trialling three working prototypes.